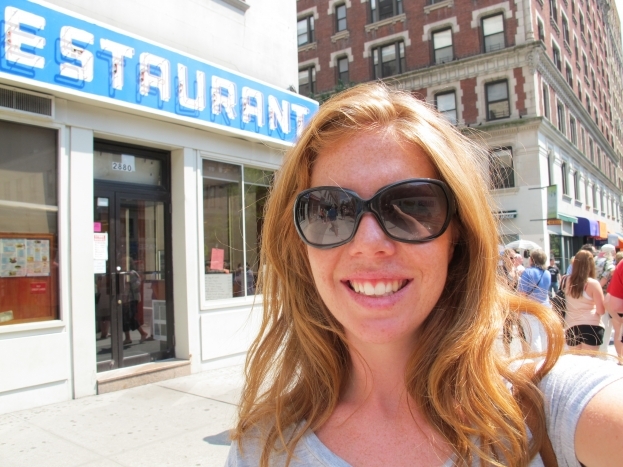 No trip to New York would be complete for any Seinfeld fan without a photo in front of Tom’s Restaurant and lunch from the Soup Nazi. 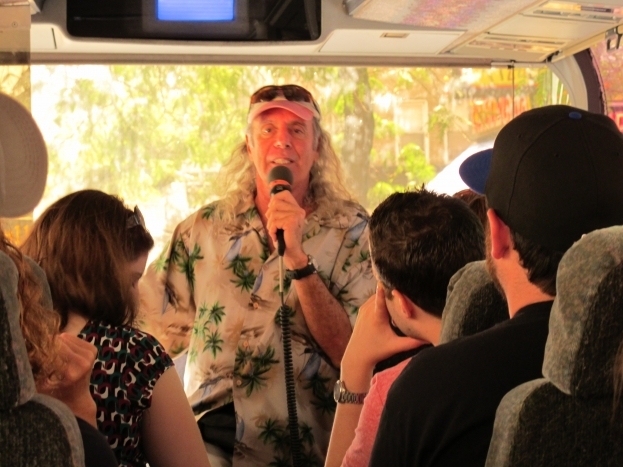 I’d originally planned to do these activities myself, until I remembered that Kenny Kramer, the “real” Kramer runs Seinfeld Reality Tours every Saturday – I had to sign up. As most Seinfeld fans would know, Kramer lived across the hall from producer Larry David when he was writing the pilot. 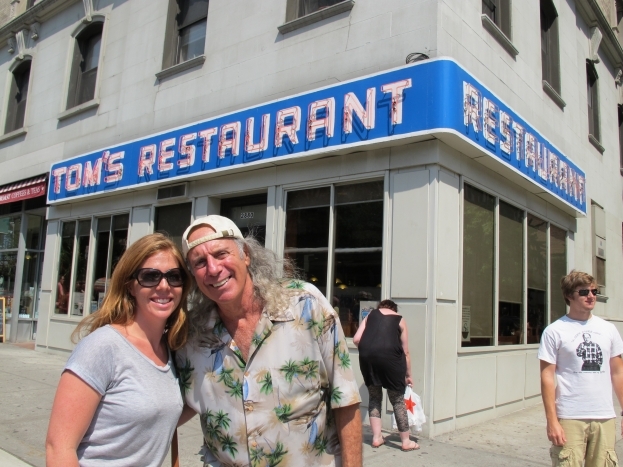 The infamous character Cosmo Kramer was based on Kenny Kramer, and I couldn’t wait to meet him in person. Like the character on the show, the real Kramer has flitted between jobs, but has managed to keep this tour alive since 1996. He’s booked out every Saturday in summer, then high-tails to Mexico for the long American winter. Life’s a dream. He sure was an interesting guy, although slightly less eccentric than I had envisioned. The long, grey, curly hair, Hawaiian shirt and backwards cap certainly made him look loose, but once he started talking, he was incredibly articulate, hilarious and approachable. 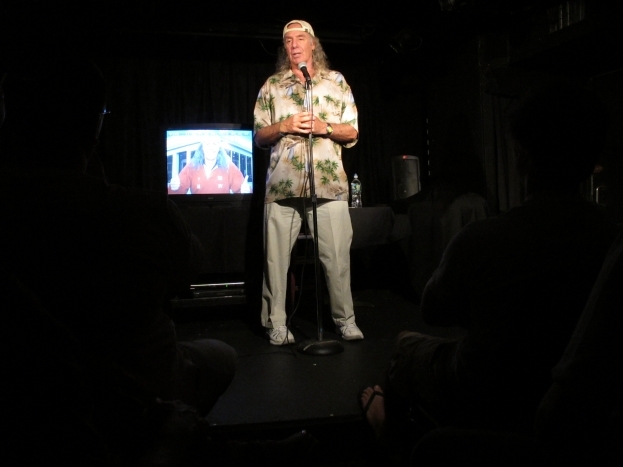 The first hour of the tour was done stand-up style in a small theatre near Times Square. Kramer shared stacks of behind-the-scenes stories, such as the fact Larry David did a number of cameo appearances throughout the series, including the voice of George’s Yankees boss George Steinbrenner. 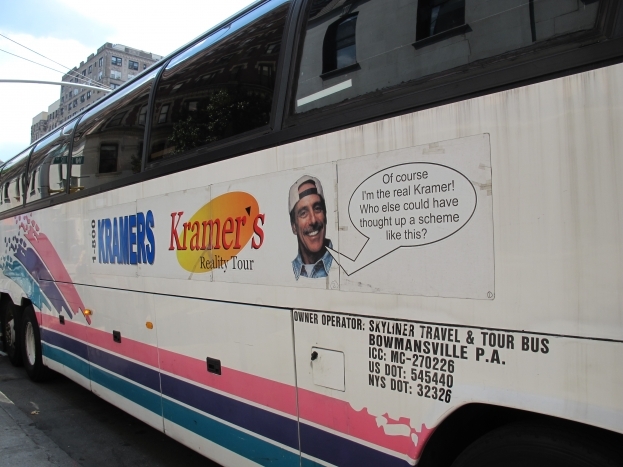 Then we got in the Kramer Reality Tour bus for a cruise around the streets of the Upper West Side, where he pointed out various Seinfeld landmarks, such as Central Park where Kramer accidentally gave a hot drink to a marathon runner, and the hospital where Elaine visited her boyfriend Jake, after buying Jujyfruits. All the while, Kenny explained how so many of the random stories he used to share with Larry ended up forming episodes of the show. 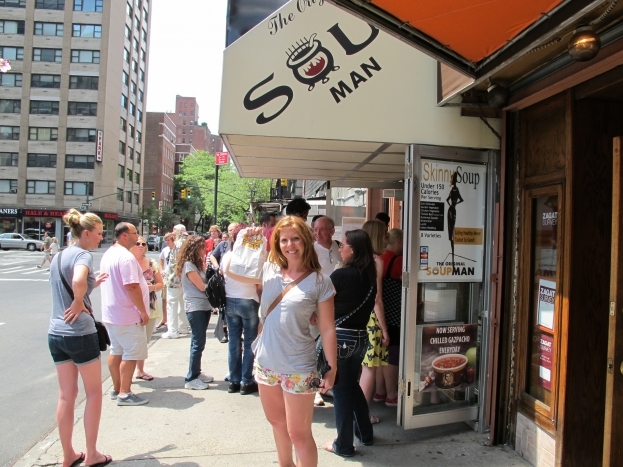 We stopped for lunch at the original Soup Nazi. Since appearing on Seinfeld, it’s become a chain and unfortunately we didn’t catch a glimpse of the man himself, but nontheless, the lobster bisque was delicious. Last stop was Tom’s Restaurant for the obligatory photo opps outside the restaurant that was the setting for so much classic Seinfeld banter. Inside is nothing like the real thing, so we satisfied ourselves with some happy snaps, before winding up the tour. It was a hilarious way to spend a New York afternoon – definitely book in if you’re a Seinfeld nut.